European leaders have given the British government an extension - pushing Brexit back until October 31, 2019. Gabriel Felbermayr lays out the economic consequences of a hard Brexit and the alternatives that the UK has to consider over the next six months. Editor’s note: This article appears exclusively online in advance of the upcoming publication in the May/June issue of Intereconomics. 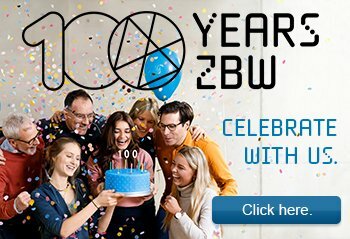 Our Forum addresses the 20th anivesary of the Euro and asks what needs to be done, to secure its future. Marco Buti, Maya Jollès and Matteo Salto open this issue with a reflection on what the EMU has achieved over the course of the last 20 years, the initial objectives set out for the euro and how they have changed over time. A pivotal point of the euro's nascent history was the global financial crisis of 2008 and the shockwaves that followed. Why wasn’t the architecture of the EMU better prepared to handle this crisis, asks Daniel Gros. After all, the euro area should have been better able to cope than the US because there were fewer sub-prime mortgages in Europe. Lorenzo Bini Smaghi and Michala Marcussen look at ways to break the sovereign-bank doom loop and create a safe asset in preparation for a future crisis. The euro at 20 looks frail, says Thomas Mayer. He proposes a ‘New Deal’ between the heavily indebted southern and less indebted northern countries to put the euro back on its feet. Adalbert Winkler is also sceptical and warns of the euro's vulnerability to regional crises, "as national(istic) politics might scapegoat integration, when the problem is actually a lack of integration." To conclude our Forum, Harold James provides a comprehensive overview of the current challenges facing the euro and weighs the best options for addressing them, such as initiatives and multilateral institutions. "Under current circumstances, a safe deposit and completion of the monetary union is only possible by changing the monetary system from credit money to bank money fully backed by central bank reserves – and eventually to digital central bank money." All articles in the March/April issue from 2017 are now freely and permanently available. This issue's Forum Universal Basic Income: The Promise vs the Practicalities explores the controversial UBI concept. Other articles cover a wide range of topics as Greece, Inclusive Growth and the IMF, Brexit and Trade, Rising Income Inequality, Systemically Important Financial Institutions and Does Trump Really Want a Strong Dollar?. 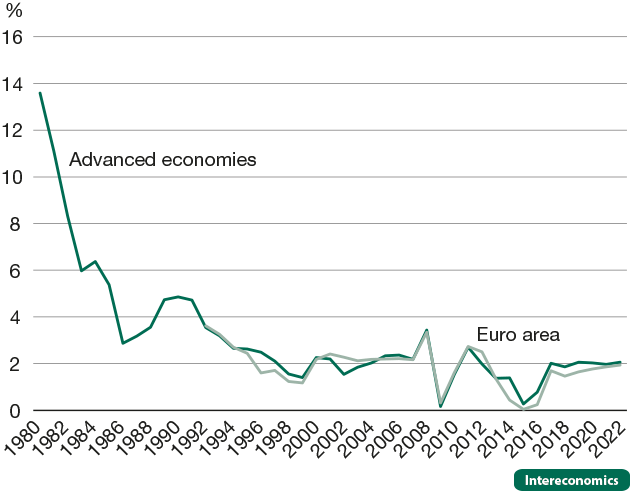 This figure from Daniel Gros' forum article Understanding the Limitations of Maastricht shows the inflation in the advanced economies and the euro area since the 1980's. While there has been much hand-wringing about the impact of Brexit on the UK and the EU, former Irish Minister for European Affairs Lucinda Creighton examines what the departure means for Northern Ireland and the northerly counties of the Republic of Ireland. The economic implications of a No Deal Brexit are stark, but the political fallout is potentially explosive. "Let there be no doubt," Creighton writes, "if the UK leaves the European Union without a deal, a hard border on the island of Ireland will be unavoidable." Securing peace and saving lives in Northern Ireland, Creighton concludes, is by far more pressing than any economic concern. The global financial crisis revealed the cracks in the Economic and Monetary Union and triggered a costly crisis, particularly in the euro area periphery. New institutions and tools were set up to address these issues including the European Stability Mechanism (ESM) and Outright Monetary Transactions (OMT). Despite this, sovereign-bank doom loops persist. Lorenzo Bini Smaghi and Michala Marcussen lay out eight factors that point to the need for a safe asset for the euro area in order to break this cycle and revive the European integration process given the important role that it plays for many of the building blocks.